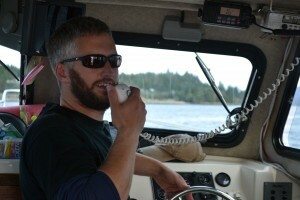 Captain Jim Parrott is one of the very few charter boat operators in Ketchikan that is both born and raised in this fine town (And he knows most of the other ones on a first name basis!). Jim started fishing as a young boy with his dad out of an open skiff in the waters around Knudson Cove, Vallenar Bay and Guard Island. At the age of 10 he was taken on as a deckhand on his grandfathers commercial fishing boat where he learned what it means to get up early and work hard all day. This lifestyle continued for the next 10 years, where Jim spent his summers as a deckhand learning all the tricks and traditions of fishing in this great and wild landscape. Under his Grandfathers watchful eye, Jim learned all the in’s and out’s of commercial trolling from leader selection to chart analysis. After his 10 years commercial fishing, Jim spent one summer as a fresh water fly-fishing guide before he got back to his roots on the ocean as a charter captain. His first charter boat was a 34 foot Silverton and from there he captained a total of 7 different charter vessels ranging in length from 22 to 40 feet. 2018 will be Captain Jim’s 15th year as a licensed Coast Guard captain and we are proud to say that he has never had a passenger from a cruise ship miss their departure time and has never had a major injury on one of his charters (except for a few hooks in his own fingers over the years). 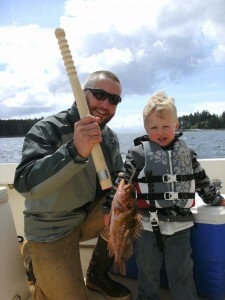 With hundreds and hundreds of days charter fishing in the waters around Ketchikan, Captain Jim has all the knowledge needed to put you on the fish! Are you ready to go on a fishing adventure with Captain Jim? Contact us now for more information and available dates!